Google made some changes to how you can design display ads to help ease the challenges advertisers and SEM agencies have been complaining about for what seems like forever. 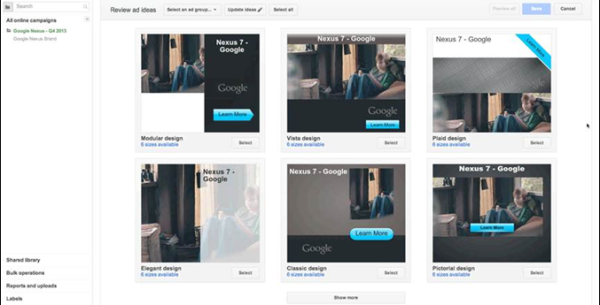 Today they rolled-out Ready Image Ads within AdWords, which aims to make it easier to create ads for multiple sizes that look good across all devices. The tool is currently Google’s best attempt to solve this issue and they hope to get more AdWords advertisers to run display campaigns, according to Ginny Marvin. The tool works by simply entering a URL from your website. From there, the Ready Image Ads tool automatically pulls images from your site to create various ads in various IAB standard sizes. These ads are also HTML5, making them compatible for viewing on mobile and desktop devices alike. As it comes time to prepare for business strategies going into the next year, many are wondering exactly how much they should be planning for in their SEO budget. Well, there is good news and there is bad news. The good news is SEO continues to yield great returns on your investment. 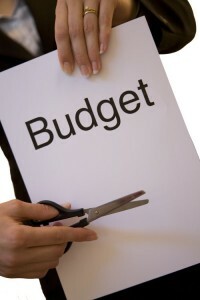 The bad news is SEO is getting more and more expensive to do well. Jayson DeMers put together five reasons you should be asking for more for your SEO in 2014. Not too long ago, you could just buy packages of a huge number of cheap backlinks and skate into high rankings on Google. That might be a bit of an exaggeration, but not much. However, Google has made it very clear they won’t let you play that game anymore. They’ve started penalizing those who try to use cheap shortcuts to a lot of backlinks, and they’ve gotten great at spotting when you do try to game the system. Article spinning, excessive social bookmarks, paid links, duplicate content, and keyword stuffing have all been ruled illegal in Google’s book. You’ve got no choice but to go legit now. While many have already managed to recover from a drop in the rankings thanks to Penguin 2.0, there are plenty who haven’t been able to make a full recovery yet, and even more who are likely to be penalized in the coming year. But, recovering from Penguin takes a lot of time and effort, and time means money. Usually, site owners need to undergo complete SEO link profile audits to identify all of the problems costing their site and begin recovery. Even if you haven’t been hit with an unnatural link warning within Google Webmaster Tools, it is still wise to perform an audit to spot any potential trouble links before Google does. Google has begun to favor quality content pretty heavily, but this also means the bar has been raised. You used to be able to write just a few short blurbs every work and get reasonable traffic and authority in Google, but now every brand has a blog. You have to put in more work to stick out. I don’t think article word count will necessarily go up as more blogging continues, but exploring your topic more thoroughly is usually a good idea. Google will still allow succinct content into the rankings for those who are looking for quick and ready answers, but that content can’t be weak. Even the shorter content you put out needs to offer a real and identifiable value to visitors. Content marketing doesn’t simply consist of publishing content. There is much more that has to be done to get that content out in front of your audience’s eyes. That’s why many have called content marketing the new SEO, even though many SEO professionals are expected to handle content creation as well. There is some truth to the idea however. Publishing useful and interesting content builds your brand and generates brand signals that do get your content ranking in search engines. However, this just shows how important it is to have a plan put in place ahead of time for your content marketing. If you don’t plan ahead, you’ll likely fall into the low quality content pattern with less flashes of quality unique work. If you are expected to handle SEO and content marketing at the same time, you’re going to need more resources to ensure everything is done right. Social media appears to be ingraining itself into search engine rankings at an alarmingly fast rate, and as such it requires a lot of attention. It is gaining steam both as an outreach and audience engagement strategy as well as driving traffic and boosting rankings. The problem is, depending on the size of your SEO team, you likely don’t have the time and means to properly handle your social media on your own. Business owners don’t have the spare time to be investing heavily into social media, and an SEO professional’s time is already spoken for by a multitude of tasks. If you’re brand can afford it, outsourcing social media means your social efforts will be focused and well planned, while your other responsibilities won’t falter. How Do You Design A Truly Great Logo? Logo design is one of the most deceptively difficult jobs in all of design. It sounds so easy, pick a font, type out the company name, and maybe underline or circle it. There are designers out there who really do think that way. But, if you actually care about delivering a quality product, its much more complicated. There are endless brands and logos out there today, and the vast majority fall away into the noise. To create a truly successful logo in the modern day, you have to design something simple but brilliant enough to make people instantly take note. In the best logos, the viewers don’t even realize why they are so attracted to the logo. But, how do you actually create a logo that accomplishes this? It takes some studied knowledge of design and a bit of ingenuity. Joshua Johnson from Design Shack has a few ways you can approach logo design to create something truly remarkable. Many of my favorite logos can be interpreted in at least two ways. The visual entendre is exactly this tactic, which wraps two images into the same visual object. There are quite a few examples of this design strategy out there, but the example Johnson uses is too perfect to ignore, the WinePlace logo. The logo is shaped like a thumbtack, seemingly marking a place or location, but if you look for more than a split second you will easily see the object also looks like an upside down wine glass. This sort of visual “trickery” encourages viewers to look a little longer and absorb the image (and brand name) more than the average glance. It is memorable for its creativity, but also because you force people to pay attention for longer. Another added benefit of the strategy is that by nature your design must be simple to play two objects into the same image. As you’ll see, simplicity is a great rule of logo design. One of the most basic facts of design is that color is not simply an aesthetic decision. Every color and tint carries a specific set of meanings and ideas, which often seem so embedded in our brains that our reactions are subconscious. Many brands will have already noted this and might very well require you to stick to a very specific brand palette, but thats not always the case. On the chance that you have freedom to choose the colors of the design, you will want to pay close attention to picking the colors that will not only look good together, but also represent the nature of the brand. On top of this, you should make sure the logo will also look clear and distinguishable if it must be printed in grayscale. Not every memo and press release will be full color, and you don’t want to lose the impact or recognizability of the logo just because someone xeroxed a company report. Trends are something that are unavoidable, but you might think twice before playing into what is hot at the moment with your logo design. Sure a popular styled logo might gain you some favor in the moment, but your logo is intended to represent your brand for years to come. You want it to be memorable enough that your logo outlives the current trends. The current example is the dramatic overuse of the circular logo, generally styled vaguely like an old college patch or badge. Circles are popular in design and these types of logos are slightly retro, but just modern enough to have become a terribly common site across the web. But, it also means they are all interchangeable. I don’t remember any brand using the style because they all look the same eventually. Some of the most popular logos throughout time rely on very little to be successful. Just think of Coca-Cola’s logo. All they need is their signature red color and a custom typeface so notable it has become the source of countless rip-offs and parodies. The best part of using custom type is that it isn’t immediately able to be copied. Designers looking for a quick and easy way to jump on a potentially successful bandwagon are quick to begin using a font. But, if you have your type hand-designed, it takes a lot more effort to mimic. The irregularities that make custom type so special also make it too unique for a simple conversion to a font. While custom fonts are certainly a simple but effective way to make your mark, some designers don’t specialize in illustration or typography. That doesn’t mean they are out of luck. Many of the most famous logos in the modern day don’t feature any type whatsoever. These logos take design to an even simpler stage, where all you need are simple shapes that are as iconic as they are refined. Apple began with their trademark bit apple shape, but originally it was striped with color. Gradually, they began to shift the logo to what looked like a brushed metal apple, but these days you won’t find any of those flourishes. All they need to be memorable is the silhouette of the apple, with that special bite taken out. There are of course many other approaches you can take to making a memorable logo. For example, Johnson also brings up a discussion of symmetry and proportion in logo design that is better fit for a more in-depth analysis. Simply put, great logos don’t leave things to chance. But the truth is, if you want a truly memorable logo, you might start by trying to create something unlike those before. TMO https://www.tulsamarketingonline.com/wp-content/uploads/2018/07/TMO-Logo.png TMO2013-09-26 12:58:112013-09-26 12:58:11How Do You Design A Truly Great Logo? What’s the best way to rank highly right now, according to Google? Most SEO professionals would say some one of two things. Creating a quality site will get your site ranked highly, and quality content is the most powerful way to improve the quality and value of your site. According to Ryan Moulton, a software engineer at Google who Barry Schwartz from SEO Roundtable implies works in the search area, high quality content doesn’t necessarily work like that. The assumption is that the “high quality” content Google favors is the most accurate and informative text available. But, Moulton says we misunderstand or forget about actual usefulness. He was defending Google in a Hacker News thread on why Google ranks some sites highly despite the content not being entirely accurate, and in some people’s eyes low quality. He explains that some sources may be the most accurate, but they are often way too high-minded for the average searcher. The answer on yahoo answers is provided by “auntcookie84.” I have no idea who she is, whether she’s qualified to provide this information, or whether the information is correct. However, I have no trouble whatsoever reading what she wrote, regardless of how literate I am. Google has to balance many factors in their search results, and the simple fact is most searchers aren’t looking for comprehensive scientific explanations for most of their problems. They want the most relevant information for their problem in terms they can understand. It should be noted Google does allow access to these academic sources in other areas of their search, but when writing for the main search page, your content needs to be accessible to your audience. Your average SEO news source can get away with using technical language to an extent, because those reading your information likely already have built a vocabulary for the topic. However, if you are offering a service or attempting to educate to the general public about your field, you need to use terms they can easily understand without a dictionary and address their needs head-on. There is still certainly a place for more extensive content. For instance, the Mayo Clinic and WebMD still rank higher than Yahoo Answers for most medical searches, simply because they are more reliable. Every year innocent and not-so-innocent searchers end up getting infected or attacked by high risk malware attacks which can harm your computer or steal your personal information. How do these people get tricked? It seems innocuous, but searching for your favorite celebrity can put your computer at high risk for attack if you aren’t careful. To help warn searchers, McAfee puts out a list each year of the most dangerous celebrities to search for. Last year’s ‘winner’ was Emma Watson, but this year earns the designation, likely thanks to her starring role in this years fantasy film adaptation The Mortal Instruments: City of Bones. Watson, on the other hand, has fallen off the list. McAfee also offered some tips for staying safe, especially if you’re going to be looking at this type of content. Online advertising could possibly become even more profitable over the next few years as it appears consumers’ trust in ads that show up in search engine results, online video, and social networks appears to be on the rise. A recent report from Nielsen, Truth in Advertising 2013 found that 48 percent of consumers trust these ads, up from previous years. The report shows that consumers around the world are gradually becoming more accepting and trusting to online media, and advertising from trusted sources is equally seen as trustworthy. Ads on branded websites are now 69 percent trusted this year, making it the second most trusted format. In 2007 it received 9 percent trusted and ranked fourth-place. The most favorable form of advertising stays the same, with 84 percent of global respondents saying word-of-mouth recommendations from friends and family are the most trustworthy. The survey also found that 42 percent trust online banner ads, compared to 26 percent in 2007, which may be why advertisers spent 26 more percent on this type of advertising in the first quarter of this year, according to ClickZ. 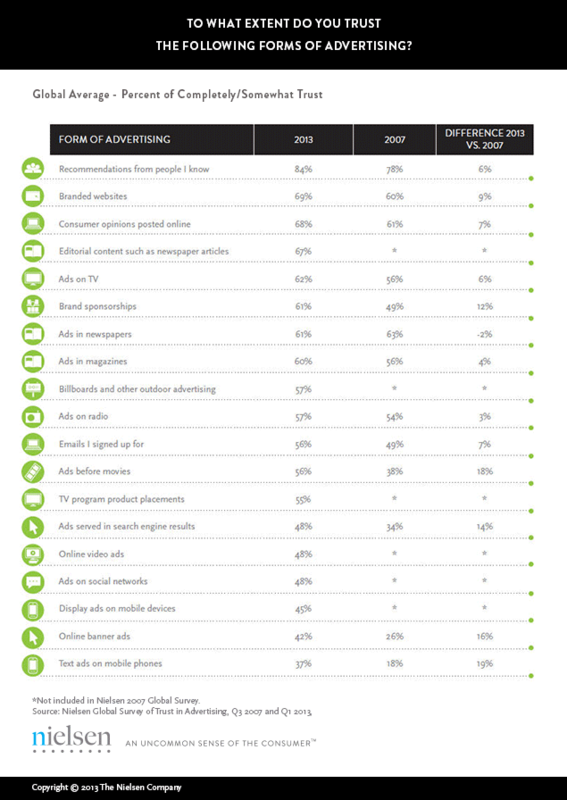 Display ads on mobile devices has also gone up, with 45 percent saying they trust these ads more than text ads. Often, online marketers talk about search engine optimization (SEO) and social media marketing as if they are entirely separate. However, online marketing is often better perceived as a complex interconnected system which is best met with a more holistic approach. SEO and social media are especially compatible bed fellows and if you get the two working together properly you’ll see incredible improvements to both sides that couldn’t be accomplished alone. A well joined strategy can see huge benefits in numerous areas such as outreach and promotion, content creation, brand management, and goal tracking. In the end, this all means more dollars in the bank for everyone involved. 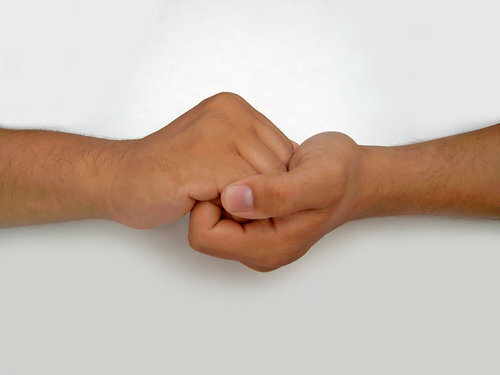 Purna Virji has some tips to help get the two running together instead of apart. SEO professionals spend a lot of time attempting to earn high-quality links, while the social media team normally aims to reach out and interact with their audience to build their brand. These may seem like unique tasks, but in reality they are very similar. Well earned links often require outreach to begin with. You can’t just buy links (well, you can but Google won’t like it) so one of the best ways to earn links in the current field requires creating and sharing content. Just about every online brand has their own blogs these days, but they often expect them to pull their weight on their own. Writers post to the blog, and expect people to simply find their content. At best they share them directly to Facebook and Twitter for free and leave it at that. Marty Weintraub from aimClear suggests taking it further and making sure your best content gets out to the public with Paid Organic Distribution. Instead of leaving the blog content to languish on its own, you can use Facebook to search out the perfect demographic that will enjoy and respond to your content. You want to look for those who are likely to share, but also seem right for your content. Then, you target them with promoted posts. This strategy allows you to reach out to possible customers who may have not interacted with your brand before while also offering them something of value. Then, with a well-placed call to action you encourage them to share, driving more organic traffic and scaling up your link building efforts all at once. Best of all, this traffic is more likely to convert once on your site, which can help improve profits. As I previously indicated, one of the most important efforts for SEO professionals these days is creating quality content. It improves how Google perceives your site while also opening up many doors for link building and audience outreach. But what exactly is quality content? While there are some writers who can magically intuit what their audience wants to know, most of us are secretly writing for ourselves, even if we don’t know it. Instead, using a joint brainstorming session to go over analytics and create a specific content strategy can improve the quality of your content and increase its sharability all at once. Have the SEOs compile a list of which audiences and types of content have resulted in the best campaigns. Have the community manager pull together data on what type of content receives the most shares and audience engagement. Have the SEOs bring in their outreach plan for the coming three months. This preparation allows you to understand which audiences you should be expanding to and how to better engage the highest performing demographics and cater content to them. You will better understand what gets the best responses and be able to plan ways to create more content that performs highly and less content flops. The community manager will also be able to plan audience engagement activities relevant to your content ahead of time. While you can always go straight to your audience, you’ll often see great results from reaching out to those who already have a lot of influence in your field. SEOs will do well to connect with influential bloggers or website owners. Not only can they have a huge impact on your link building efforts, but one link from them can result in a high rate of qualified leads that can lead to conversions. There are even tools for helping to identify the biggest influencers if you aren’t sure. Klout, FollowerWonk, and Traackr all create lists which will tell you who to engage. Be careful not to just reach out with a sales pitch. You aren’t trying to gain a link, but build a real relationship between influencer and content creator. Start by sharing their content and retweeting posts, or helping out on community and audience endeavors. Create a reciprocal relationship where the influencer will be inclined to scratch your back in return. Once you’ve built the relationship, getting them to share links to real quality content will feel natural. Those that see the links will also perceive your brand in higher terms of credibility, as you are co-signed by a trusted influencer. In general, web designers seem to like tools and resources that speed up their work and ease some headaches. This is most notable by the sheer number of them available. Nearly every design blog or website offers some unique design kit or has a recent blog post sharing the best recent kits. You might be asking what a design kit is, but these kits aren’t uniform. They come in all shapes and sizes, varying wildly in scope and cost. They also range in quality from ‘incredibly useful’ to ‘waste of harddrive space.’ The best definition for a design kit is any prepackaged tool or piece of software which aids in the creation of a digital design project. 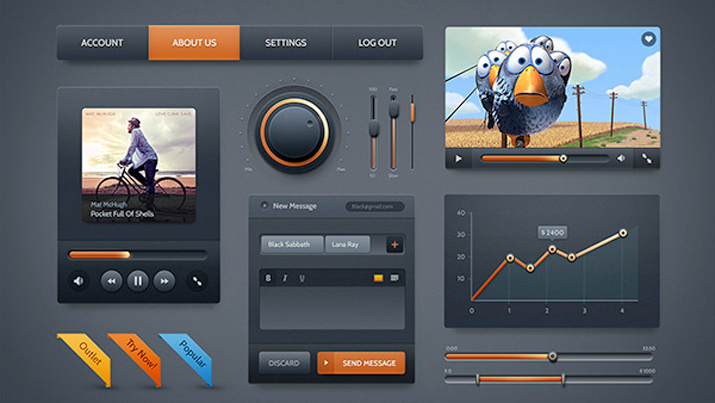 Some design kits come with interface packs, buttons, and graphics all intended to be used together. They may come with a specific color and font palette, but they are almost always customizable. Some kits are niche designs aimed at solving a specific problem, while others are catch-all assortment or full design templates. The thing is, while these design kits can definitely help a designer in a time-crunch, they have their fair share of drawbacks, as Carrie Cousins discussed in her recent article for Design Shack. Costs – One of the biggest issues with these kits is they don’t always come cheap. There are some great free kits available, but you should expect to pay for kits filled with premium features. For some budgets, this alone can rule out using a specific design kit. Thankfully most kits are relatively cheap for single license use. Too Similar – Some kits begin to look bland because all of the parts are designed to be used together, but without a full finished design in mind. This can result in kits with 50 nearly identical buttons in an assortment of colors. It is up to the designer to choose parts that will look interesting together, but it can be tiring trying to sort out a repetitive and boring kit. Incomplete Kit – Be careful to read all of the details for any kit before you buy so you know what you’re getting. A 1,000 piece kit may seem really useful and interesting until you discover it is largely made or elements you can’t really use. Many kits are themed and only contain certain types of icons such as social media buttons or calendar icons. Don’t spend money on something that doesn’t offer what you need. Looks Too Much Like Another Site – Obviously the biggest problem with using pre-made tools and elements is eventually you’re site will look astonishingly like someone else’s who also used the tool. Many designers aspire to work solely from scratch specifically to avoid this problem, but you don’t have to completely swear off design kits to be original. Use the kit as a starting point. If you use all the elements and layouts as they came, you’re much more likely to look like any other site. If you spend the time to give these elements your own personal touch, you’ll look equally unique. Pinterest may only be the fourth most popular social media platform out there, but it may become a significant part of your online marketing strategy in the near future. Last Thursday, Pinterest CEO and co-founder Ben Silbermann announced the company is beginning testing promoted pins, their version of paid advertising. The site is primarily popular with females, but it is well loved by social media marketers because its users have shown time and time again that they are more willing to purchase than the demographics using any other social media platform. Facebook may have over eight times the traffic of Pinterest, but they aren’t purchasing at anywhere close to the same rate of the Pinners. However, in the almost four years since its creation, Pinterest has never included any paid advertising. Relevant – Pinterest is aiming to ensure the ads you’re seeing are relevant to the content you are actually looking for. Improved based on feedback – The company plans to take user feedback into heavy consideration while rolling out paid advertising, as well as working to improve the experience. The first promoted pins are being tested in search results and category feeds. If you search for “Halloween” you might get promoted pins for costumes. Pinterest definitely isn’t leaping into the advertising options, but they are beginning a change which could be very lucrative for enterprising social media marketers in relevant fields. TMO https://www.tulsamarketingonline.com/wp-content/uploads/2018/07/TMO-Logo.png TMO2013-09-23 14:58:062013-09-23 14:58:06Pinterest Begins Testing "Promoted Pins"
Google Webmaster Tools is one of the best tools at your disposal for making sure people are able to find your site, but a surprising amount of people run websites and never open it. Matt Cutts, head of Google’s Webspam team calls not using the free Google webmaster resources one of the five most common mistakes a site owner can make, so it makes sense to share some information about the tool. For those that don’t know, Google Webmaster Tools is free software that helps you manage the more technical aspects of your website. It is especially loved by SEO professionals because it offers various diagnostic reports on numerous areas of your page from the best possible source. You can find out why you aren’t ranking or review your link profile, but Webmaster Tools also provides a direct hotline between Google and website owners. If you have been hit with a penalty, you are notified in Webmaster Tools. Google Webmaster Tools is often confused with Google Analytics, which is a sort of companion software to Webmaster Tools. However, Analytics is aimed at marketers and provides data more relevant for that area. Both provide extensive resources and options for optimization, but for SEO you will be much more interested in Webmaster Tools. You will have to be logged into your Google account which you use for Gmail or Google+, which you should undoubtedly have if you are running a website. Once you’ve logged into Google, you can go to http://www.google.com/webmasters/tools and begin the process of setting up your account. Bruce Clay offers an extensive tutorial with four different options for verifying you are a site owner and setting up your account. Once you’ve verified, you are set to explore the options and resources available. It may take some playing around to get the hang of, but you’ll be amazed at what you can accomplish within the software. There are also numerous guides available to help you understand what can be done with Webmaster Tools.